From beautiful coastal cottages in County Clare to big farmhouses in County Kerry and youth hostels in Cork, our range of holiday homes in Southern Ireland are ideal for big families and groups of 10+. Southern Ireland is a spectacular holiday region with lots to see and do from wonderful walks near the Cliffs of Moher in County Clare to sightseeing in Limerick City and Cork, or days on the beach in the seaside resorts of Ballycotton, Youghal, Cobh, Dungarvan and Ardmore. In this section you will find holiday cottages in County Cork, Clare, Limerick, Tipperary, Waterford and Kerry, covering the whole of the southern part of the island. On the famous Ring Of Kerry, offering stunning accommodation for up to 26 people in 3 period properties. Idyllic coastal setting. Great for families, golfers, celebrations, with optional catering. When you think of holiday cottages in Southern Ireland, you might imagine coastal cottages in County Clare, city centre youth hostels in Cork or Limerick, or spacious farmhouses in Tipperary. At Group Accommodation, we work hard to fulfil these dreams, and as a specialist group holiday company we are dedicated to bringing you the best big group holiday homes. It's tough deciding where to go in Southern Ireland, with such a fabulous choice of attractions and a wide choice of group accommodation. If you rent holiday cottages in County Clare, the beautiful natural scenery is a huge draw. The Burren, a unique karst region, is full of unusual flora and faunt, while facing the Atlantic Ocean are the stunning Cliffs of Moher. Visit interesting places such as Loop Head, Doolin, Spanish Point, Scattery Island, Kilbaha, and the Sliabh Aughty Mountains. A holiday house in County Limerick lets you explore beautiful countryside and go sightseeing in the city of Limerick to discover King John's Castle, St Mary's Cathedral, the Hunt Museum, the University of Limerick and the Treaty Stone or join an Angela's Ashes walking tour of the city. Elsewhere in County Limerick you can visit Adare Manor, Castle Oliver, Clare Glens, Croom Castle, Curraghchase Forest Park, Foynes Flying Boat Museum, Glenstal Abbey, and Lough Gur. If you rent a holiday house in County Tipperary, you can enjoy diverse inland landscapes including scenic mountain ranges such as the Knockmealdown, the Galtee, the Arra Hills and the Silvermine; have a go at a range of watersports on Lough Derg; and visit endless places of interest such as Athassel Priory, Holy Cross Abbey, Cahir Castle, Glengarra Wood, the legendary mountain of Slievenamon, and Mitchelstown Cave. Hole up at a holiday cottage or farmhouse in County Waterford and you can explore the beaches of its volcanic coastline, including the seaside resorts of Dungarvan and Ardmore and the Copper Coast, a UNESCO Geopark. You can go hiking in the Knockmealdown and Comeragh mountain ranges; see Ireland's longest river, the Suir; marvel at ancient megalithic tombs and ogham stones, and hear the Irish language spoken around Ring (An Rinn), a 'Gaeltacht' or Irish-speaking area. If you stay in group accommodation in County Cork, you get to kiss the Blarney Stone; spend time on the beach at seaside resorts like Ballycotton, Youghal and Cobh ; take a trip to Carbery's Hundred Isles and Fota Island, with its Fota Wildlife Park; and go sightseeing in Cork, Ireland's second largest city, home to the church tower of Shandon, Red Abbey, City Hall, Elizabeth Fort, the Cork Opera House and St. Mary's and St Finbarre's Cathedrals. In gorgeous rural Cork you can explore mountainous landscapes of the Beara Peninsula, the Ballyhoura Mountains on the border with Limerick, and the Shehy Mountains, home to Knockboy, the highest point in Cork. In Ireland, home to many mountains, lakes and an Atlantic coastline, find a big hliday cottage in County Kerry for your holiday in Ireland. 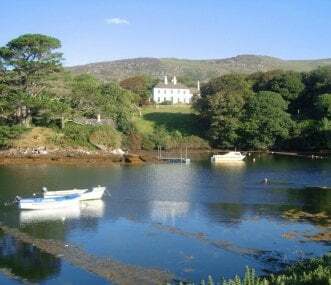 You can take a trip to the Blasket Islands; climb Carrauntoohil; explore the ecclesiastical sites at Ardfert and the Megalithic tomb of Eightercua; visit Ross Castle, Muckross House and Scotia's Grave; or chill by the Lakes of Killarney or Fenit Harbour and Marina. We try to make it easier for you to decide where to stay by providing detailed property descriptions and images for every holiday home in Southern Ireland, alongside a list of activities available nearby. Our Irish holiday cottages are scattered right across Southern Ireland's counties, so you can find large holiday properties in County Cork, Clare, Limerick, Tipperary, Waterford and Kerry. By using our map functionality, whether you're planning a short weekend group break, a big reunion, or a full week's holiday, you can quickly narrow down your search to the specific part of Southern Ireland that appeals to you most. Our selection of accommodation for large groups is unrivalled, so you can be confident that we have a large Irish holiday home to suit your needs. Our portfolio features farmhouses and large holiday cottages as well as a range of other types of accommodation ranging from camping barns and hostels to luxury farmhouses, big country houses and activity centres. We take all of the hassle out of searching for group accommodation by providing an easy-to-use website that brings together the very best big Irish holiday homes for you to choose from according to your own set of criteria. You can browse all of the properties in Southern Ireland in our Regional Search; pick out specific holiday homes by area on our Map of Southern Ireland; or use our Main Search to narrow down your results by several criteria such as location, property type and how many the holiday cottage sleeps.